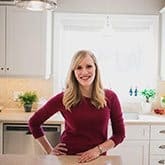 Recipe posted first on The Recipe Critic. I don’t know if you can understand how much I love meatballs. Seriously, you guys — they’re right up there as one of my favorite dinners. Pineapple Brown Sugar Meatballs or spaghetti and meatballs or sweet and sour meatballs, I’ll take them all. With rice, noodles, or mashed potatoes, it doesn’t even matter. Just pass me the bowl and nobody gets hurt. 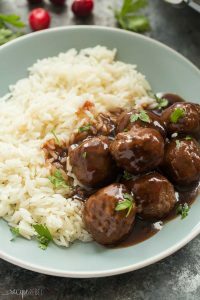 So maybe it’s a little strange then that I’ve only ever shared exactly one meatball recipe here on The Recipe Rebel. I had to change it. I love when I can find lean ground beef on sale. 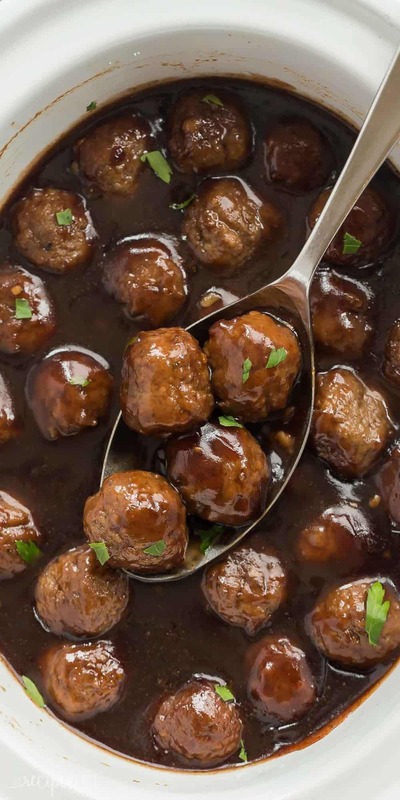 I’ll buy it in bulk and just make up a huge batch of meatballs to store in the freezer for those days when dinner is the last thing on your mind (um, hello — pretty much every day with a newborn baby!). But sometimes you run out (maybe we’ve had too many of those days??) or just don’t get around to it, and store-bought meatballs work just fine. There will be no judging here — I’m just lucky if I can get out of my pyjamas and into the shower on a regular basis! I try to look for packaged meatballs with minimal ingredients. 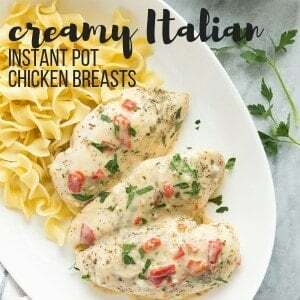 Often you can find some in the meat section of the grocery store that just need to be pan-fried or baked before throwing in the slow cooker, and you know they’re pretty fresh. The cranberry sauce and balsamic vinegar is a combination you definitely don’t want to miss — it’s sweet and tangy and makes the most glorious, thick, red sauce that’s perfect over mashed potatoes or rice (or spooned straight into your mouth if that’s your style). 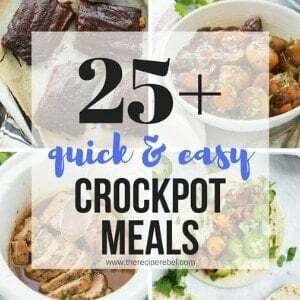 I love my 2.5 quart slow cooker for recipes like this — it heats up nice and quickly but there’s still lots of room. It’s the perfect size for small dinner recipes or holiday or game day appetizers. If you want to lighten this recipe up a bit, feel free to use turkey or chicken meatballs and add extra veggies — perfect for a quick, healthy dinner! The sauce is pretty tangy (which I love!) — if you prefer a mellower flavour, try starting with just 1/4 cup balsamic vinegar. 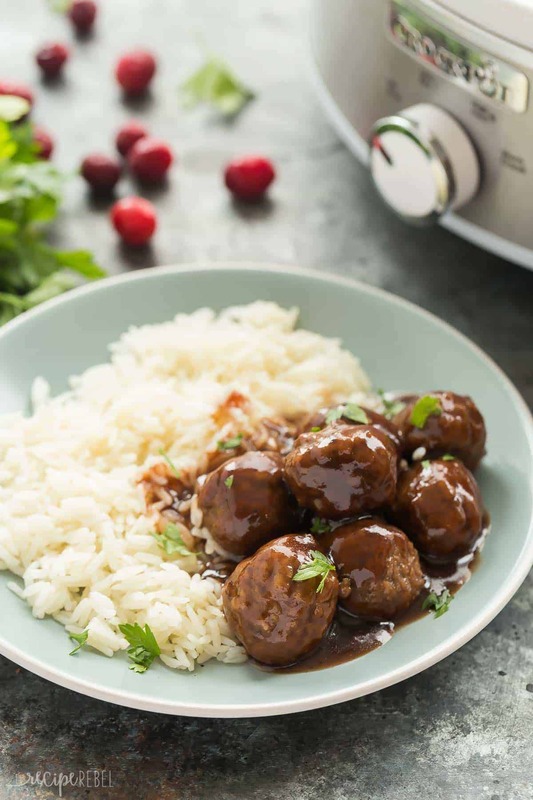 These Slow Cooker Cranberry Meatballs are sweet and tangy with a little spice -- the perfect holiday appetizer or easy weeknight dinner! 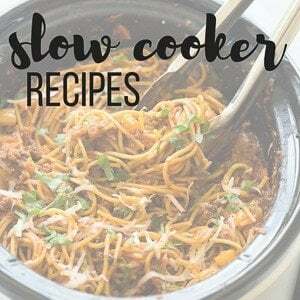 In a 2-4 quart slow cooker, whisk together cranberry sauce, honey, vinegar, broth, corn starch, garlic, salt and pepper flakes until combined (may still have a few lumps). Cover and cook on low for 4-6 hours or high for 2-3 hours, until meatballs are heated through and sauce has thickened. Serve alone as an appetizer or over rice or mashed potatoes.